The first railway in Great Britan dates back to October of 1603. Almost 100 years before Buckingham Palace was built. Opening on June 18th, this brand new exhibit at the Red Brick Arts Centre and Museum will give an in-depth look at the history of one of Edson's iconic buildings. Displaying 99 artifacts to represent each year the building has stood, visitors will be able to see objects from the collection never-before-seen. Everything from a Saxaphone to Dr. Seus's first edition of 'I Saw it Down on Mulberry Street' will be up for display in the art gallery until July 31st. What are the origins of the CBC? The start of CBC began with an advertising gimic in 1905 with the Grand Trunk Railway Company. They had an idea to broadcast radio shows in the cars of the trains for added entertainment. Unfortunately for them, their idea didn't match the technology available yet. It was only when Canadian National formed in the early 1920's that the idea became a reality. Canadian National formed the first ever National Radio Network. It aired church services, plays, musicals, talk shows and travelling tips and was heard not only by the people on the train, but by bystanders near the train stations. The Canadian Government bought out the network for $50 000 in 1931 and renamed it the Canadian Radio Broadcasting Corporation which later became known at the Canadian Broadcasting Corportaion. The new Galloway Station Museum and Travel Centre website is now live and ready to be explored. The website has access to our rental calendar and rates, exhibit information, history, gift shop artists' bios as well as a first look at some of our collection on our virtual exhibit. Edson has always been known for its vibrant arts community. The Edson Summer Pavilion Series will showcase local talents and put our new pavilion to work. The goal of the series is to provide family friendly shows at no cost to the public. The three main concerts will be Rockin’ the Park, The Harvest Jam and An Evening of Bluegrass. In addition, a theatre presentation is being planned. All of these events will feature local musicians, actors, artists and entertainers. The town is also working with Creative Campus to bring in up to four travelling shows featuring artists from the Yellowhead corridor. The shows will be promoted as family events and will include entertainment specifically for kids. There are also plans on providing free juice and snacks to make it a truly no cost event for everyone to enjoy. The Edson Summer Pavilion Series is a joint venture between the Town of Edson, the Edson Rotary Club, Creative Campus, Edson’s arts community, local service groups and Edson businesses. The Summer Shows will begin in mid June and conclude in early September with one major event each month. Sunday June 17, 2012 – Rockin’ the Park – Concert, Opening Ceremonies, and Artisan Market at the Museum. Sunday July 1, 2012 - Canada Day Activities. Sunday July 15, 2012 – Children's Day. Sunday August 12, 2012 – An Afternoon of Bluegrass and Folk Music. Plus a Free Community Pig Roast. Tuesday August 14th - Outdoor Movie Event "ET"
September 9, 2012 – Harvest Jam – A Country Music Festival. Donations for the food bank will be accepted at each event. 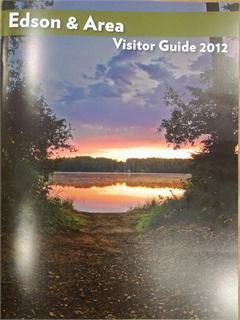 The new Edson and Area Visitors guides are hot off the press and ready to guide you through the many interesting places Edson has to offer. From the new Spray Park to shopping to the many parks in and around the area, there is something for everyone. You can also check it out on our website at www.gallowstationmuseum.com. Written by Jack Glen Sr., this beautiful book recounts his life as an Alberta Forest Ranger in the Athabasca forest mountains and foothills from 1920-1945. It contains many pictures of the area and provides an intimate look at the life of a forest ranger. The gift shop received some gorgeous pottery from the potters in Edson. They have really outdone themselves this time, with a great array of sculptures, bowls, mugs, bookmarks, Edson pins and many other beautiful pieces. The authors trace the changing relationships between people and forests as humans first travelled through the area. then stayed to struggle, survive and eventually flourish first despite the forest, then in harmony with it. Filled with maps and large photos, it's a definite read. The Big Eddie bridge was rebuilt 4 times.